The continuation of the Vacation film series, aptly titled Vacation, might’ve worked if it was titled anything else but Vacation. The fifth film in the franchise feels nothing like the previous four and thus suffers because of its title. When trying to continue a series, a film should feel somewhat like it’s predecessors right? But alas Vacation is just a typical R-rated raunchy comedy and fails to recapture the wittiness of the original Vacation. 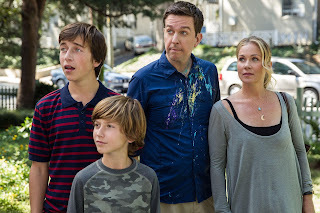 Vacation, as stated before, is the fifth film in the franchise that began in 1983 with National Lampoon’s Vacation (Review). The film follows Rusty Griswold (Ed Helms), who is all grown up now since the days of the first four films, as he tries to bring his wife, Debbie (Christine Applegate) and two sons, James (Skyler Gisondo) and Kevin (Steele Stebbins) closer together with a trip to Walley World. Sound familiar? That’s because it is the exact same plot as the first one. “The new vacation will stand on it’s own”, the quote is shown in almost every trailer but is quite obviously not true. Not only do they go to the same destination as the first, but the pictures on Rusty’s laptop that were clearly promotional photos from the previous films to playing Holiday Road whenever they could, it all becomes too much. Now it’s now truly fair to judge it simply against what came before, but even looking at the movie from an objective angle one can see the right pieces just aren’t there. The family doesn’t feel real and they’re simply given personalities that will cause conflict. Personally I really like Ed Helms and Christina Applegate in their previous comedic roles like The Office or Anchorman respectively, but they just don’t have it here. And the son’s attitudes and personalities are so over the top and unfunny it’s painful. While the comedic timing problems fall on the actors, the bad jokes fall on the writers/directors, Jonathan Goldstein and John Francis Daley. The over-reliance of vile gross out gags and raunchy comedy are obvious and become exceedingly dull as the film progresses. There are some shining moments throughout the runtime though few they are there. The bad thing is they all come from miniscule side characters. Whether it’s Chris Hemsworth as the conservative husband of Audrey Griswold, Charlie Day as a heartbroken white water rapid tour guide, or the collection of officers at the four-corner monument out west. All of these characters provide more memorable jokes in a lot less screen time and that just doesn’t work in a comedy focused on a family and their road trip. Then Chevy Chase appears. Instead of a rewarding moment of recognition for the 71-year-old actor, the appearance is rather sad. The jokes provided are not terribly funny and in the end leave Chevy appearing as nothing more than an Easter egg provider once he gives Rusty the old station wagon. The old car is, impressively, in pretty good shape, much better shape than the film.